Bogotá is one of Latin America’s most polluted cities—but thanks to its citizens, its air may be getting cleaner. A decision from the mayor’s office to keep using diesel fuels in the next generation of buses in the city’s bus rapid transit (BRT) system, TransMilenio, set loose a series of events, led by citizens, demanding cleaner air and challenging the local paradigm that less-polluting fuels are too expensive to consider. Today, Bogotá is closer than ever to a cleaner BRT fleet. What can we learn from Bogotá? Citizens have the power to promote sustainable development, even when there is an apparent lack of political leadership through sustained political organizing and pressure. Like many other cities, Bogotá has been very slow in the adoption of new and cleaner technologies for its transport system. There has been pilot testing of one electric bus and no more than a handful of tests of natural gas fuels. 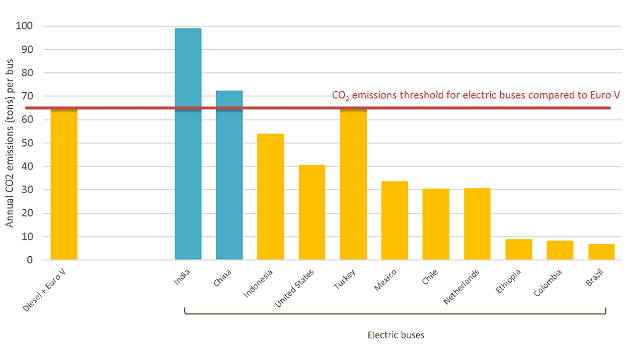 Potentially the largest benefit of electric buses comes from the fact that they have no tailpipe emissions, which reduces the health impact of harmful local pollutants in cities across the globe. Bogotá’s BRT is used for 2.5 million trips daily. And its users are disproportionately exposed to air pollution: concentrations measured inside the BRT buses are by far the worst of all the city’s transit modes. In March, the city of Bogotá issued a draft tender to replace 1,383 buses corresponding to the oldest of its BRT fleet. Initially the document explicitly said that the buses to be used in the city had to have internal combustion engines, although this was quickly reversed to also include electric motors. Despite this change, the city was only offering an incentive of 50 points out of a total of 2000 to companies that operated cleaner technologies, such as electric and natural gas. To many, this incentive was insufficient, as the city was missing a clear opportunity to improve Bogotá’s air quality by demanding cleaner vehicles. Even a change.org petition was started to try and bend the Mayor’s will. What ensued next shows the power of organized resistance in the digital era. A wide range of actors, without any clear connection to one another, organically organized a resistance movement against the city’s decision to exclude cleaner technologies. Civil society came together under the citizen’s air quality roundtable and sent a letter to the mayor, demanding the inclusion of zero-emission buses. Citizen science also played a key role in informing the general population on high air pollution exposure levels in the system with measurements taken by citizens and shared via social media. The hasthags #TransMilenioDejameRespirar (“TransMilenio let me breathe”) and #NoMasBusesDiesel were soon trending on Twitter. Almost at the same time, Colombia’s national environment minister sent a letter to Mayor Enrique Peñalosa requesting the inclusion of low- and zero-emission vehicles in the tender. And the city council, which acts as a check and balance on the mayor, called for a debate on the topic, expressing their concern about the exclusion of cleaner technologies. The academic community also joined the movement. The deputy dean of one of Colombia’s most prestigious universities, and an expert in air quality and transportation, lamented the decision of the mayor explaining that he couldn’t find any technical reasons for Bogotá not to hop on-board the electric bus movement. Finally, the office of the inspector general issued a warning, and asked the mayor to respect international treaties on climate change and comply with its mandate of ensuring a safe environment for its citizens. All these initiatives were picked up by the national news with various reports on the matter highlighting the importance of the process. The debate even reached the financial sector as the development bank Bancoldex announced that they would no longer finance diesel buses. Mayor Peñalosa at first resisted. City hall used misleading data in an attempt to minimize the impact that their decision had in Bogotá’s air quality. The health secretary denied the proven health effects of air pollution and diesel emissions, and the mayor even blamed dust as the main cause of poor air quality instead of vehicle. But mounting pressure from multiple sectors eventually resulted in a substantial change in the tender. On April 24, Peñalosa announced an increase from 50 to 400 additional points to operators and suppliers that include gas and electric buses in their proposal, giving these technologies an edge over diesel. Since no minimum quotas were included, it is too early to say if this new incentive will effectively lead to a massive inclusion of cleaner technologies. Hopefully Mayor Peñalosa and other politicians in charge have received the clear message that citizens are no longer willing to ignore the environmental costs of current systems. There is still a lot to be done for Bogotá’s air quality. Major issues with other sources such as freight transport and industry remain. And many other cities in the region also face worsening air pollution and an absence of effective action. However, what happened in the past few weeks is a clear example of how organized and well-informed citizens can achieve the changes our cities need. 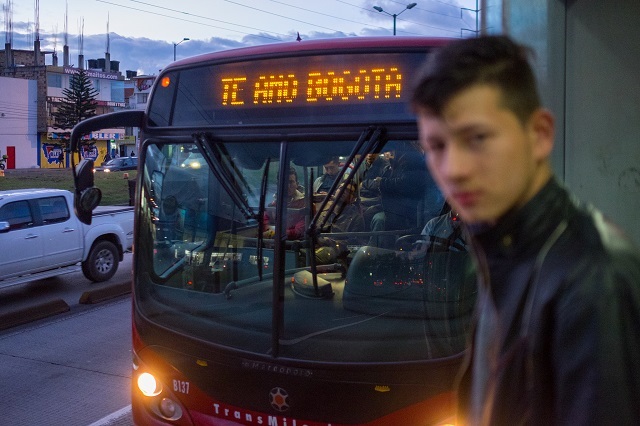 The TransMilenio BRT is an iconic element in Bogotá and the integrating actor of all public transport in the city; the expectation is that it should lead by example. Despite not being the highest-emitting source, it is in a unique position to kick-off needed technological advances in diesel transport fleets and public transport generally. Politicians today may choose not to believe facts and science in their decisions, but we have the responsibility to pressure them to pay attention to our demands. Juan Pablo Orjuela is a PhD student working on air pollution exposure as part of the PASTA project under the supervision of Dr. Audrey de Nazelle. His main focus is on developing statistical models to estimate exposure in three European cities (London, Antwerp and Barcelona) based on black carbon measurements and surveys. Sebastian Castellanos is an Energy & Climate Associate at WRI Ross Center for Sustainable Cities.